As we approach the NCAA Tournament, there has been a lot of debate recently over whether the Big East deserves 11 teams in the Big Dance. As it stands right now, the Big East has nine teams ranked in the RPI top 30 (G’town 5, Pitt 9, Notre Dame 10, St. Johns 13, UConn 15, Syracuse 18, W. Virginia 21, L’Ville 23, Villanova 29). In addition, Cincinnati looks like a lock at 21-6 and an RPI rank of 40. The team on the bubble is Marquette (16-11, RPI 68) who probably needs a strong finish to get in. In the last five years, the Big East has placed 37 teams in the NCAA tournament. That is nine more than any other conference (ACC and Big 10 have had 28). And while those 37 teams have won 54 games, the Big East teams don’t have any championships in those five seasons. 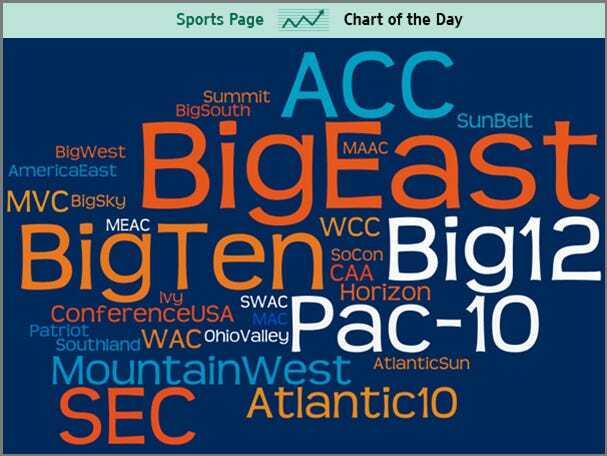 Below is a word cloud (created using Wordle.net) that shows every conference that has participated in the NCAA tournament over the last five seasons. The size of the names reflects the number of bids that conference has received. Of the 31 conferences*, 16 received only automatic bids to each of the five tournaments. 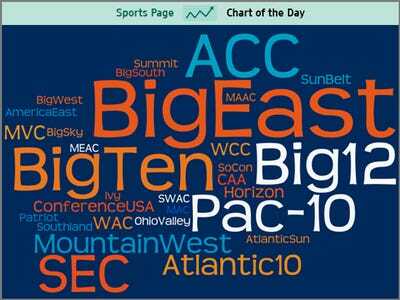 All data is via CBSSports.com. *The Mid-Continent Conference changed its name to the Summit Conference in 2008.